Mercedes-Benz has partnered with AMG to create the ultimate sports package to give the new C-Class Coupe Sport the sportiest feel possible. Mercedes-Benz has just revealed several additional details of its C-Class Coupe Sport, including the all-new AMG Plus Sports Package. Mercedes will feature the AMG package on the C 250 Sport and C 250 CDI Sport. The new C-Class Sport models were developed in conjunction with AMG, a subsidiary of the Mercedes-Benz that specializes in high-performance luxury cars. AMG is typically recognized for its more aggressive looks, higher performance and better handling than typical Mercedes-Benz vehicles. AMG models are generally associated with the most high-end Mercedes vehicles, which is true with the new C-Class Sport lineup. In the case of the C-Class Sport, Mercedes partnership with AMG has resulted in the all-new AMG Plus Sports package. The newly introduced sports package coincides with Mercedes aim to make the C-Class sportier than ever. "Refined sportiness is a brand value we hold dear, and with the new Sport models we are shifting the emphasis of the C-Class a little more towards sportiness," said Dr. Joachim Schmidt, Executive Vice President Mercedes-Benz Cars, Sales and Marketing. "This means that in the C-Class, alongside the top-of-the-range C 63 AMG, we have the widest ever line-up of sporty models." So how exactly does the AMG Plus Sports package set the C-Class apart from other luxury sports cars? According to Mercedes, its collaboration with AMG has produced two uniquely sporty cars both inside and out. Appearance-wise, the AMG Sports package includes AMG 7-twin-spoke light-alloy wheels, AMG spoiler lips, which give the exterior a uniquely sporty feel. When taking a look an interior, drivers will find sport seat in black ARTICO hand-crafter leather, red seat belts and red topstitching on the steering wheel, seats, door panels, door armrests, center console and shifter. 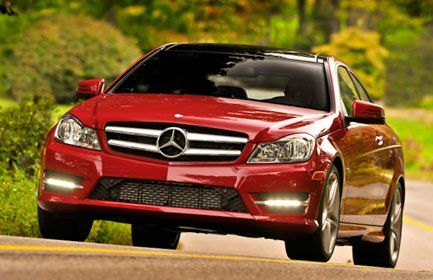 For the U.S. market, the 2012 Mercedes C-Class Coupe will be available in two engines: a 4-cylinder 1.8-liter gasoline-powered engine that develops up to 201-hp and a V6 3.5-liter edition that produces 302-hp. Both engines will be matted to a 7-speed automatic gearbox. European consumers have the option of purchasing a gasoline-powered engine or a diesel. Gas options include two 4-cylinder with 154-hp and 201-hp and a V6 that turns out 302-hp. There are also two diesel choices available: a 4-cylinder 168-hp and 4-cylinder 201-hp model. The new Mercedes-Benz C-Class Coupe Sport models will be launched in Europe in June 2012 and in September in U.S. markets.